EASYDCC is a full featured command control system based on the popular NMRA standard called Digital Command Control (DCC). DCC makes locomotive control simple and fun while simplifying your layout's wiring. With just a single pair of wires, your layout can accommodate many independently controlled trains and many operators. This catalog showcases the various items that make up an EASYDCC system including basic starter systems as well as components to expand a starter system. The Command Station: is the brain of your control system. The Command Station takes in commands from many sources, such as throttles, formats the commands into appropriate locomotive commands and sends out the finished information to the track boosters. The Command Station also provides a window into the status and operation of all the connected parts. It has several diagnostic modes which help pin down the cause of any odd operation issues. The Command Station automatically handles the complex and inter-dependent timing of throttle commands such that every operator is provided with excellent response to all locomotive commands issued from a throttle. More details and features are described in the Command Station section. The ZoneMaster Booster and Booster Power Supply: provides power to the track for all of the locomotives equipped with NMRA-DCC compatible decoders. In addition, ZoneMaster boosters provide a reservoir of power for the high current sound decoders. All sound decoders have a huge inrush or surge current requirement when power is applied. The ZoneMaster coupled with the recommended booster power supply can supply up to 30 Amps of surge current without tripping the electronic circuit breaker. More details and features are described in the Command Station section. The Built-in Command Station Throttles: Unlike other systems that force you to purchase extra throttles, you'll be delighted to discover that the EASYDCC command station includes TWO built-in and independent throttles. Expansion Options: your layout will grow and expand so EASYDCC is ready to expand when you are. For example, choose from 3 types of remote throttles; or perhaps add extra boosters, or maybe some remote turnout controllers. Whenever you are ready to expand, simply plug in the new items and enjoy. It could not be any easier, plus wireless and plug-in can be used at the same time. Wireless Throttles: One of the more popular components of an EASYDCC system is the wireless throttle. Wireless throttles have no cord nor do they need to be plugged in to use a locomotive. Just key in the locomotive number and you are ready to roll. The wireless receiver provides the link between your wireless throttles and the Command Station. Wireless BaseStation Receiver: The wireless receiver provides the link between your wireless throttles and the EASYDCC command station. Up to 16 wireless throttles can be used. The Installation and Operation manual has additional considerations when more than 8 throttles are to be used. For large layouts, multiple receivers can be used to provide complete coverage. Multiple receivers allow obstructions, long distances and other reception problems to be easily conquered. If you find an area with poor reception, simply plug in another receiver and connect it to the throttle bus. Plug-In Throttle: The economical and popular plug-in throttle is easy to use and packed with features. It uses a rugged two-conductor phone-plug which provides you with years of trouble-free operation - even in the hands of our roughest operators. The throttle does not require any batteries. It is lightweight and comfortable even during long operating sessions. Fascia Plates and Kits: The plug-in throttle connects to the Command Station using simple fascia plates and TV coax cable. Only two wires are needed making installation simple and quick. All cable connections are done with twist-on connectors. The small throttle bus extender board has more than enough power for most layouts. Additional extender boards can be added for very large layouts. Turnout Decoders: Accessory decoders are used to control and drive layout devices such as switch machines, lights and other stationary devices. Any device, equipped with an accessory decoder, can be activated and controlled from any throttle and/or, the command station. Power for the Accessory Decoders comes from either the track power or an external DC power supply. 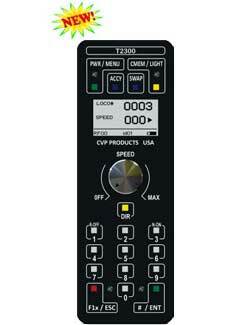 Programmable outputs can be set to flash, pulse or continuous on. The outputs can be connected to via a terminal strip, edge-card socket or direct soldering. The instructions for using the products described on this page are contained in the EASYDCC System Manual. Click here to download a copy.